Advanced Social Status allows you to display an advanced WordPress Dashboard widget to display your Social Networking Fans/Followers and status. You can define what social networking sites you want to the plugin to display the information for. You can add any UserId or website URL to the plugin so that you can retrieve the counts for a different site than the one you have the plugin installed on. Ability to change the Dashboard Widget title. Display your Facebook Likes, Facebook Share counts. Display the number of Twitter Followers, number of users you are Following on Twitter. Display number of Tweets yo have posted and the amount of Twitter Shares. Display your Google+ Follower count & Google+ Shares. Display SoundCloud Follower count & SoundCloud Views. Display YouTube Subscriber count & Views. Display amount of Dribbble Followers. Display amount of Envato Followers. Display amount of Pinterest Followers. Display amount of GitHub Followers. Display amount of MailChimp List Subscribers. Ability to display certain features and disable certain features, IE You can decide not to display the output for certain Social Networking sites. Ability to choose between three separate icon styles. Ability to display icons in 1, 2, 3 or 4 columns. Multiple widgets configurations. Drag and drop Social Network service icon ordering. 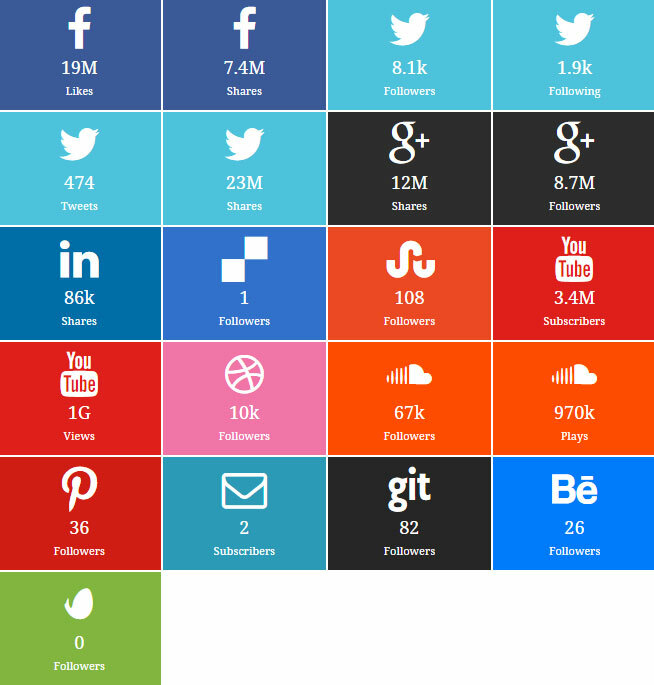 You determine the colors for each Social Network service. Front end widget as well as WordPress Dashboard widget. Display your Facebook Likes & amount of Facebook Shares. Display your Twitter Followers, the amount of users your are Following on Twitter, the amount of Tweets you have posted and the amount of Twitter Shares you have. Display the amount of Google 1 Followers & Google shares your site has. Display the total amount of users that Follow you on LinkedIn. Display the amount of Delicious followers your site has. Display the amount of Stumbleupon followers your site has. Display the amount of SoundCloud followers a user has as well as SoundCloud views. Display the amount of YouTube subscribers you have as well as YouTube views. Display the amount of Envato Followers you have. Display the amount of Dribbble Followers you have. Display the amount of Pinterest Followers you have. Display the amount of GitHub Followers you have. Display the amount of MailChimp Subscribers a mailing list has..
You have the ability to drag & drop the Social Networking icons into any order you desire. Display or hide individual icons. Select any of the 3 available Social Networking icon designs ranging from square, round or cylinder..
You determine how many columns you want the widgets to be displayed in. Upload the the plugin folder “advanced-social-status” (not just the files in it!) to your `wp-content/plugins` folder. If you’re using FTP, use ‘binary’ mode. Navigate to the WordPress Dashboard widgets page, drag the “Advanced Social Status” widget onto one of your WordPress theme sidebars to display the front-end widget. 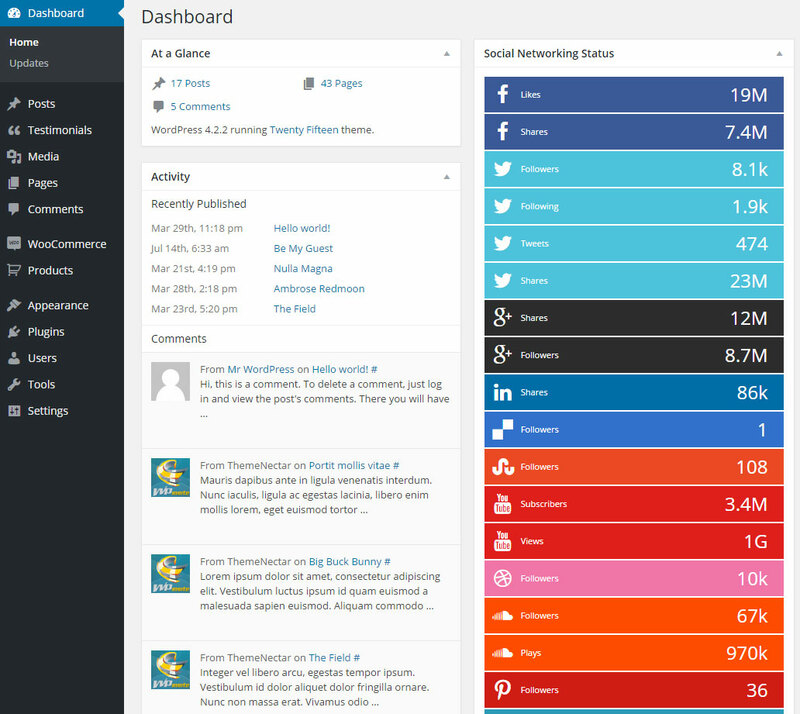 Navigate to the WordPress Dashboard page to view the Admin Dashboard widget.